That is the number of young men who were mown down on the first day of the Somme in 1916. 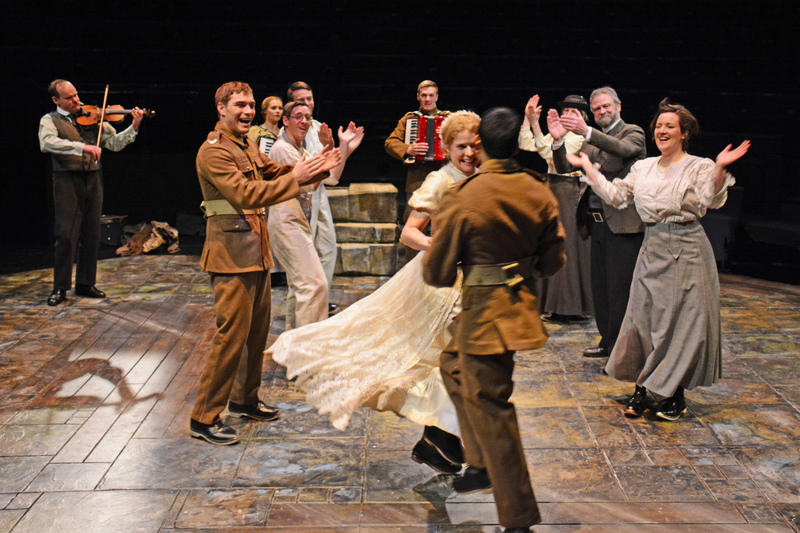 To mark the centenary of The Great War, Northern Broadsides is touring Deborah McAndrew’s new play An Autumn Bank Holiday Lark. As an actor, McAndrew will always be remembered as the feisty Corrie legend Angie Freeman, but since departing the Weatherfield cobbles she has developed a reputation as one of the North’s best playwrights, often in tandem with Halifax-based Broadsides. Her new work, partly inspired by Philip Larkin’s poem MCMXIV, is focused around the annual rush-bearing festivals which began when churches had earth floors and the rushes were brought into soak up the mud tramped in by worshippers. “It is a big deal and happens during the Wakes Week when the mills closed and, in some areas today, they still call a week in the August holidays The Wakes,” explains McAndrew. “They were staggered across the area so not all the mills were closed at any one time. McAndrew has created a fictional Lancashire mill town called Greenmills which is preparing its huge rushcart in August 1914. For three young men, their lives are about to change forever. Northern Broadsides has built a reputation as a company that reflects working class life through the arts. 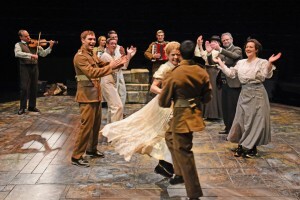 So it’s not surprising that this play looks at the ‘war to end all wars’ from the perspective of the ordinary soldiers and the community they left behind. “One of the things I feel strongly about in my play is that these fallen soldiers of the First World War are identified as soldiers and claimed by the army as their men, but they weren’t really,” says McAndrew. “The men and women who die now are professional soldiers who have made that career choice and they are highly trained. It’s in their blood in the way theatre is in mine, so when I look at them they are doing what comes right to them. The seemingly endless routine of men going over the top to their deaths led to the description ‘lions led by donkeys’. But, according to McAndrew, we see them as naïve because we are 100 years away from the social norms of the time. “We look at the trenches and the war from the very privileged 21st century perspective where we get up and have a hot shower and a latte before we start work,” notes McAndrew. “We don’t lay a fire and crack the ice in the bowl for a wash. These were tough people where women died in childbirth and from ordinary illnesses like measles or flu. The three characters who go have lived a hard life, and they are not the babes we would be in the same situation. 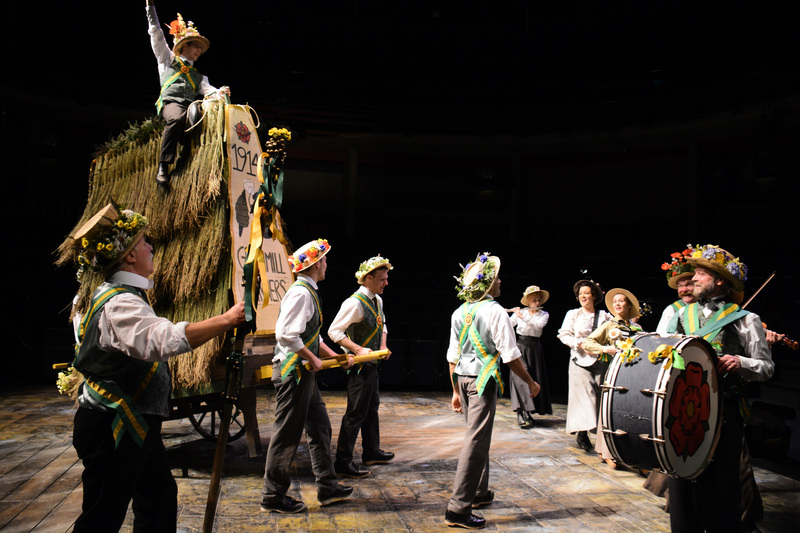 Unlike high profile West End hits like War Horse, the action never leaves Lancashire. “I had a lot of little rules for myself when writing this play after Broadsides artistic director Barrie Rutter asked me for it, and one note to self was don’t go to the war. We never leave Greenmills because there have been lots of plays that have gone very effectively to the Western Front. The other challenge was how to construct the elaborate rushcart. “We thought about how we were going to build it so I said the designer will solve it. They’ve come up with a theatrical version which can be assembled quickly and taken down easily,” says McAndrew. “It has to be built on stage and taken down because you can’t bring it on and off as it is so huge. We even get a man on top. The Great War cost the lives of 995,939 British men but for McAndrew it is the words of individuals that have the most resonance a century after the slaughter.